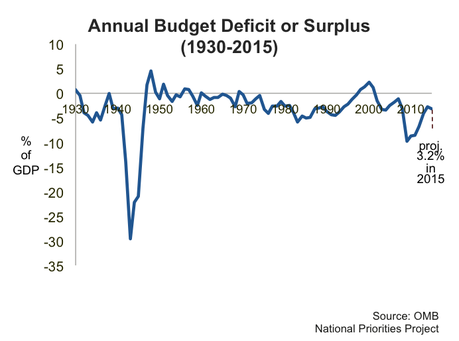 What is the Budget Deficit? Each year, part of the federal budget goes toward paying down interest on the federal debt. In 2015, about six percent of all federal spending, or $229 billion, will go toward paying interest on the federal debt. Since 1976, on average about ten percent of the annual federal budget has gone toward paying down interest on the debt. Most budget proposals, including the president's and those from various groups in Congress, feature deficit reduction through either decreased spending or increased revenues, or both. For instance, the president's proposed fiscal year 2016 budget would run a deficit of $474 billion in fiscal 2016,  with plans to achieve $1.8 trillion in total deficit reduction over 10 years. Budget resolutions passed by the House and Senate for fiscal year 2016 would reduce deficits to zero through extensive spending cuts and no planned revenue increases. The debt ceiling is the legal limit set by Congress on the total amount that the U.S. Treasury can borrow. If the level of federal debt hits the debt ceiling, the government cannot borrow additional funds, which could lead to sudden interruptions in government services. Congress has the legal authority to raise the debt ceiling as needed. From 1940 through spring of 2015, Congress has raised, suspended, or otherwise changed the debt limit 114 times. Raising the debt limit does not authorize new spending, but allows the Treasury to pay the bills for spending that has already been authorized by Congress. A recent Pew Research poll found that deficits have fallen somewhat as a priority among Americans. In January 2013, 72 percent of poll respondents said deficit reduction was a top priority; two years later, that had fallen to 64 percent. As for how to reduce budget deficits, a solid majority of Americans support raising taxes on both the wealthy and corporations. Office of Management and Budget, Historical Table 1.2. U.S. Treasury, Debt to the Penny and Who Holds It. Office of Management and Budget, Historical Table 1.1. Office of Management and Budget, Historical Table 7.3. Pew Research poll, conducted January 7-11, 2015. AFL-CIO poll, conducted November 4, 2014.